As a department of Lynn County Hospital District, LCHD Rehab & Fitness Center provides a full range of outpatient Physical Therapy treatments including hot/cold packs, paraffin, ultrasound, electric stimulation, iontophoresis, phonophoresis, massage, ice massage, traction, balance/gait training and exercise. LCHD Physical Therapy now has the Alter G Anti-Gravity Treadmill! Thanks to its precise unweighting technology, the Alter G Treadmill allows us to reduce gravity’s impact by reducing up to 80% of your body weight. This allows patients to rehab lower extremity injuries with less pain and less impact and improve mobility, strength and safety for those with neurological conditions (stroke etc.). We accept a wide variety of insurances including Firstcare, Team Choice, Blue Cross Blue Shield, Medicare, Medicaid, Worker’s Compensation, etc. 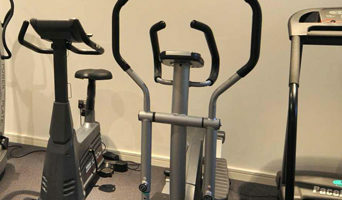 The LCHD Fitness Center is loaded with state-of-the-art cardio equipment and a variety of strength training equipment and machines to help you get fit! Open to the public. Come by for a tour of the facilities! The LCHD Fitness Center is a Silver & Fit facility. LSVT BIG Certification – Parkinson Disease treatment program focused on improving quality of life for those diagnosed with Parkinson Disease. Functional Movement Screen Certified – high-level athletic screen that pushes people to the limit of stability and flexibility to uncover underlying deficits. With physical therapy treatment I enjoy a focus on hands-on treatment techniques that focus on patient-centered goals to return to work, play, or activities of daily living. I enjoy the variety of outpatient therapy that involves functional and physical impairments that can occur from head to toe. My passion is to see patients achieve goals they never thought possible following an injury and to help them return to their lives with as little pain and impairment as possible. I enjoy outdoor activities, hunting, running, shooting, water sports, and watching most all other sports. My wife, Kayla, and I have a 15 month old son Hunter, and are expecting another son, Tucker, in November. Kayla is a graduate of Abilene Christian University with a degree in graphic design and has a talent for designing business cards, wedding invitations, logos Etc. We share our home with an energetic puppy and a lazy cat. We look forward to getting plugged into this community and finding a church home to help us grow in our faith. Go Bulldogs!